Most people associate the name ‘garnet’ with the dark red varieties, (pyrope, almandine or, possibly, rhodolite.) Garnets, however, actually come in many colors and have a wide variety of names, which I have listed at the bottom of this post. Often garnets will even be a combination of these colors and not always fall clearly into one variety. (The classification of garnets is actually quite complicated and the term covers over ten different gemstones so I will be revisiting this post when I’ve gotten further with my gemology studies to go more indepth). 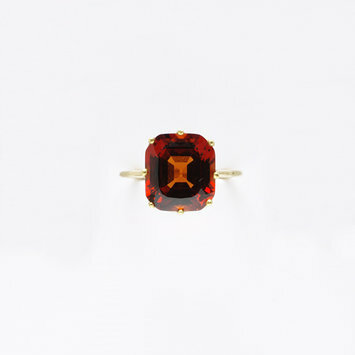 During the Victorian era, particularly during the mid and late Victorian era, (1856-1900), dark red garnets were extremely popular, particularly pyrope garnets with their deep, blood like color. The Victorians of that era of course loved all things dark colored and garnets were considered appropriate for mourning attire. 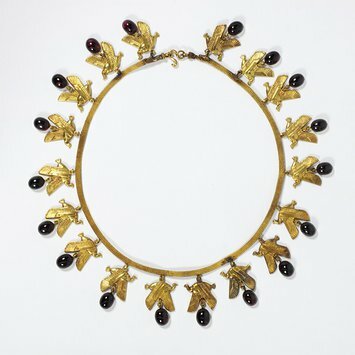 Garnets were very often rose cut and could be set in gold or silver, but very often they were set in a low carat gold alloy (ie tombak). 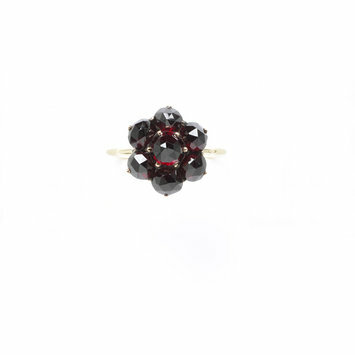 Garnets were thought to cure blood disorders and to prevent bad tempers. 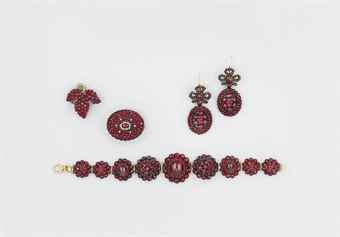 Pyrope garnets and almandine garnets are very difficult to tell apart by eye and are frequently mistaken for each other. Pyrope garnets under a microscope will display fewer inclusions so are generally considered to be slightly more valuable but not greatly so. Often, red garnets are actually a mixture of both pyrope and almandine and this is another one of the reasons for the confusion. I have also noticed that even the major auction houses and museums don’t always try and name the exact variety of the garnet if it is red and will simply just refer to it as ‘garnet’. 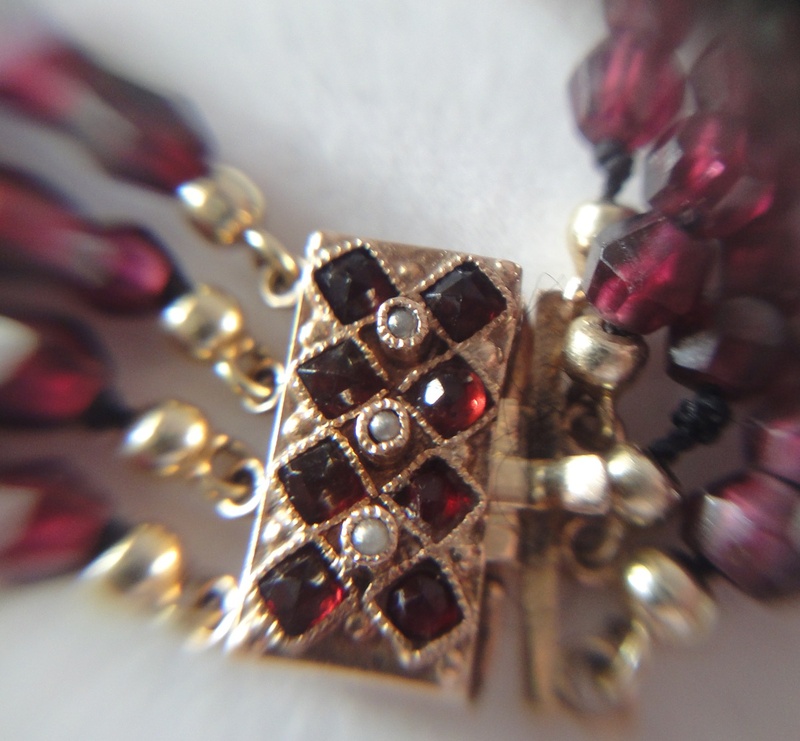 Victorian garnet bracelet with rose gold and seed pearls. Other kinds of garnets, such as this hessonite garnet (more of a brown-orange color) were used less frequently. Demontoid garnets, with their amazing bright green color, are considered to be the most desirable and valuable kind of garnets used. (Tsavorite and Uvarovite are also bright green and valuable but are extremely rare and generally not found in antique jewelry). It is easy to mistake demontoid for the less valuable stone peridot so please check carefully. Misnomers for demontoid garnets are olivine and Uralian emerald. Demontoid garnets were not discovered until 1868 in the Ural mountains of Russia so you will not find a piece older than that. (They were discovered by the same person who discovered Alexandrite). The name ‘demontoid’ comes from the French ‘diamant’ meaning ‘diamond’. Demontoid garnets have astonishing luminosity that rival diamonds. It is very rare to find a demontoid garnet in a large carat so be very wary if you come across one. They have not yet been synthesized. 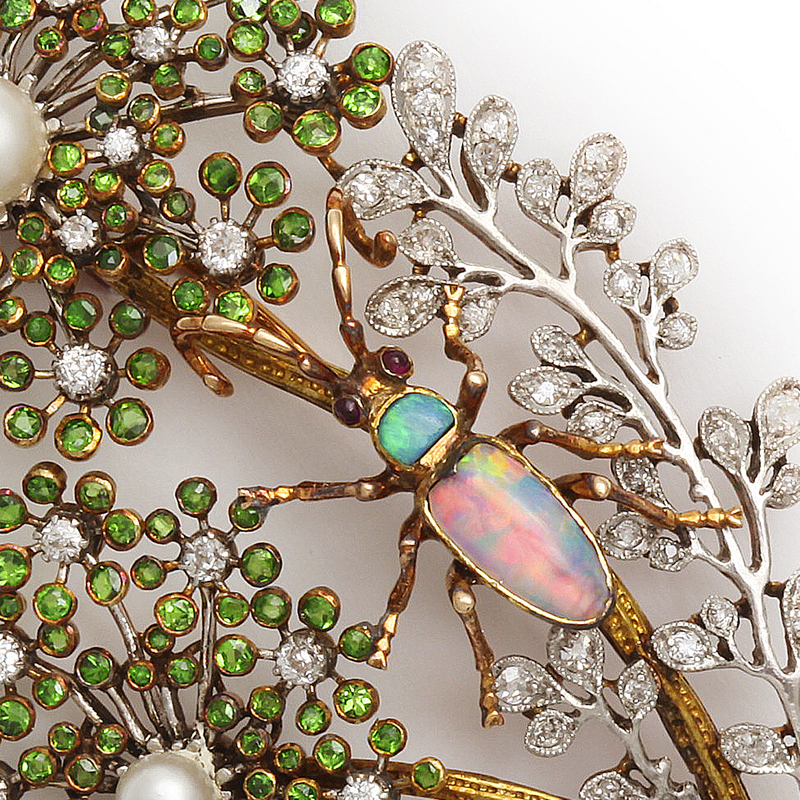 Famed Russian jeweler Carl Fabergé was an enormous fan of demontoid garnets and really brought them to the fashion forefront. 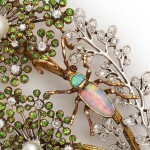 They are also associated with Tiffanys of the late 19th century. Demontoids very much appealed to the naturalistic aesthetic of the era and are found in many higher end late Victorian and Art Nouveau pieces, often, in the case of Art Nouveau pieces, to represent foliage. 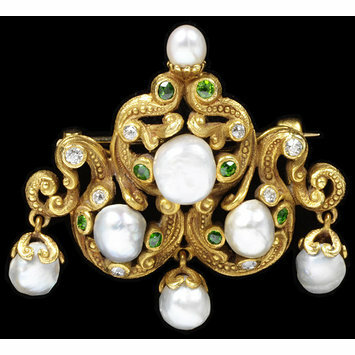 Demantoid, pearl and gold brooch. V&A Museum (American buyers were known to prefer a more toned down version of Art Nouveau style). Namibian demantoids, discovered more recently, are not considered as desirable as Russian demontoids and lack a signature ‘horsetail’ inclusion. It is interesting that in the case of demantoids, the inclusion is considered as something desirable. Namibian demontoids will not be found in antique pieces. There are also a lot of imitation glass garnets on the market, in all colors. Also, garnet jewelry is still produced and is very popular to this day, often with antique styled settings, so it is important not to be mislead if you believe you are buying an antique piece. 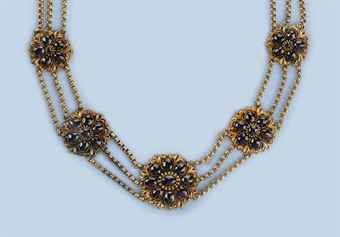 Synthetic garnets are not commonly used in jewelry. If you are purchasing a piece of antique garnet jewelry check carefully to see if any of the stones are missing. Also, check to see if they are set properly (with a prong or claw set) or glued in as this will affect the value. Sources/ Further reading: (please be sure to also look at my sources in the drop down menu at the top of this page).